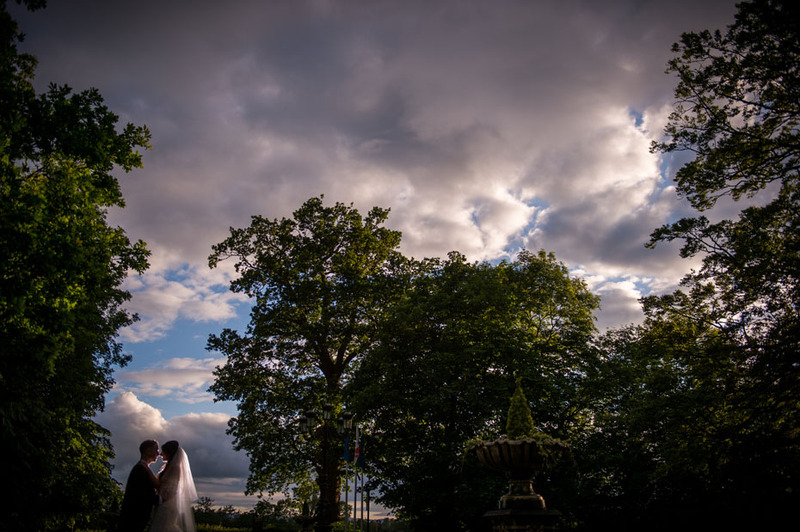 In rural Cheshire, the Country House Hotel & Spa, the Best Western Llyndir Hall Hotel was the perfect choice for Frzana and Rob to host their stunning wedding day. After driving down the long and winding road, they stumbled across this stunning white building, surrounded by beautiful gardens and instantly fell in love with it’s charm. Their wedding morning arrived, Frzana enjoyed spending time over breakfast with her Bridesmaids and Sister, at the Llyndir Hotel. Being treated like a Princess, she had them to hand helping her get ready for the day. She said she felt ‘cool as a cucumber’, although she was excited that their special day had finally arrived, after all the wedding planning. She had her hairdresser Stephanie, along with make-up artist Rebekah Treherne, at her side too. Frzana’s beautiful dress was designed by Sophia Tolli and from Society Brides. Her shoes were from Elegant Steps and she found her stunning hair clip from Debenhams. The groom, Rob, worked at the Racquet Club for 8 years and is a good friend of mine. He always said if he ever got married, he’d want me to be his wedding photographer. So the day finally arrived and I got the chance to do just that. Rob, along with his groomsmen, wore traditional tails wedding suits, which were hired from Slaters. Rob’s younger cousins performed on their guitars – which was absolutely amazing. Frzana mentioned that when she was sitting watching her, the song she sang was one she actually wrote. She held in her hand some Polaroids and it touched her heart and had happy tears streaming down her face. Frzana & Rob would like to mention, they are so thankful that their friends and family came to join them in celebrating their special day and witnessing the start of their lives together. Their best man and brother of the bride’s speeches, were so heartfelt too. Both the daytime wedding breakfast and evening rooms were design beautifully. Vivid Floral Design arranged their flowers and table decorations and helped with dressing the wedding venue. Cake in Chester, baked their stunning wedding cake and I must say it was delicious. Frzana had a design and ideas in mind for their wedding stationery and so, Devil Design created just what she wanted. I asked them both what were their memorable moments and they said – although there were so many – Seeing Rob’s face when Frzana walked down the aisle and saying their vows to each other, held an equal amount of tears and laughter from everyone. The funniest moment was when Rob accidentally said “care and passion” as opposed to “care and compassion” during the wedding ceremony. One of Frzana’s favourite moments was dancing to U&I, Galantis – everyone joined in, as they were surrounded by all their friends and family and the night ended on such a high – Frzana says she still gets goosebumps from hearing the song.